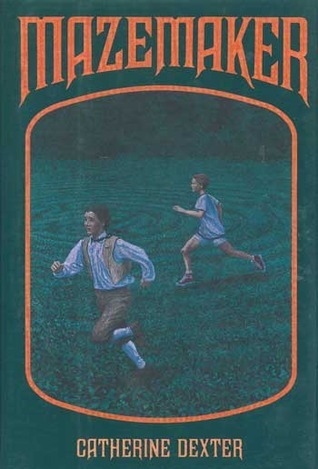 Mazemaker, by Catherine Dexter (1989), sounded like it would be just the sort of time travel book I like--a girl follows a cat along the lines of a labyrinth spray painted on a school playground, and finds herself back in the garden of a 19th century house...in an overgrown maze. She makes friends with girl who lives there, copes with strange clothes and other issues concomitant with time travel, and figures out some of the history behind the maze and its magic, thwarting a bitter older woman who wants to use the magic for her own purposes. And then she goes home, wiser and more appreciative. So the plot was just fine, with nice mysterious elements, and the menace posed by the woman wanting to use the magic for herself made it somewhat gripping. But emotionally it felt a little flat. 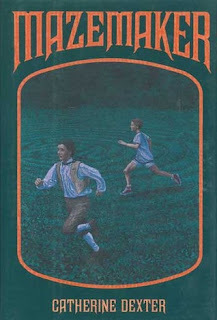 Perhaps a book that I would have enjoyed more as a child myself, though I do think it would never have been one that hit me hard. Reminds me a little of The Freedom Maze--time travel, a labyrinth, a swamp... Sounds like this one has a heroine not as likable as the other though, and that's usually a deal-breaker.